Even with high quality data, meaningful metrics, and thoughtful reports, you still need to get insights to the right people at the right time to make an impact. With Power BI, you have a comprehensive range of options for distributing reports and dashboards to your organization. By far the simplest way to share in Power BI is by using the Share Dashboard button – with one click and an email address you can send a real-time, live updating dashboard to your colleagues. Today we’ve released an enhancement to the Share Dashboard feature to make it even easier to use. If your organization uses Office 365 for email, you can now share to an email distribution group just the same way you would send an email in Outlook. Just enter the address of the distribution group and click Share. All members of the distribution group will receive an email invitation to view the dashboard. Even better, if you are worried your colleagues might miss the email invitation, you can use the URL of the dashboard from your browser in your own emails or on internal web pages to direct users to view your dashboard. Anyone who you’ve shared with will be able to click the links and see your dashboard (this works regardless of whether you share with individual email addresses or distribution groups). You can start using distribution groups today in Power BI. 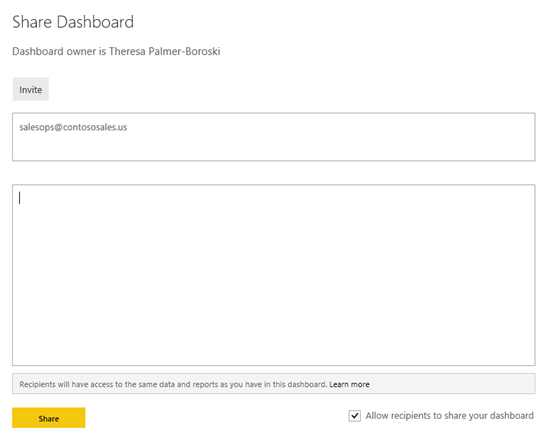 While dashboard sharing is the easiest option for sharing in Power BI, if you’re looking for more advanced features check out Groups in Power BI and Organizational Content Packs, which provide multi-user collaborative editing and more granular security.